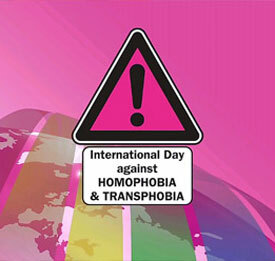 On International Day Against Homophoia, Transphobia, and Biphobia, we stand in solidarity with lesbian, gay, bisexual, transgender, and intersex (LGBTI) persons worldwide. We celebrate the progress made to advance a world where all persons are respected and can live free from fear and discrimination. And today we reaffirm our belief all persons are born free and equal in dignity and rights. Last February, I was honored to appoint the first ever Special Envoy for the Human Rights of LGBTI Persons, Randy Berry. In his first year, Special Envoy Berry has traveled to over 40 countries, discussing the human rights of LGBTI individuals with senior government officials, and bringing together the faith and business community, in recognition that we all have a role to play in advancing equality. Around the world, U.S. embassies and consulates work closely with LGBTI communities in support of equality. We integrate respect for the rights of LGBTI persons throughout our assistance programs. Through the Global Equality Fund, we provide direct support to LGBTI civil society organizations to enable them to produce social change. Here at home, we know that when communities exclude, we do not—cannot—reach our full potential. When people are arrested, harassed, or even killed, just for being who they are or expressing whom they love, we all suffer. So our work is not over. On this day—and every day—let us redouble our efforts to create a more just and fair world for all. Onward. In honor of the International Day Against Homophobia, Transphobia, and Biphobia (IDAHOT), the Council for Global Equality is pleased to release the report from the 2014 Conference to Advance the Human Rights of and Promote Inclusive Development for Lesbian, Gay, Bisexual, Transgender, and Intersex (LGBTI) Persons. The conference was co-sponsored by the U.S. Department of State and USAID, with support from the Council for Global Equality. 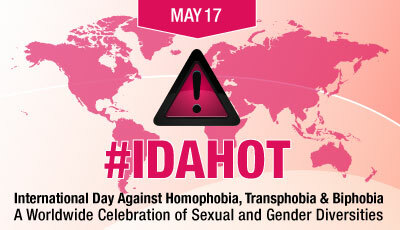 The theme for this year’s IDAHOT events is “Stand with LGBTQI Youth: Fight for visibility, respect and equality.” Here in the United States, studies show that over 40% of homeless youth identify as LGBT. Across the world, similarly startling statistics reveal the disproportionate vulnerability that LGBT and intersex youth face due to bullying in schools and online, abuse and expulsion from home, forced marriages, denial of health services, discrimination at work, and increased risk of suicide and depression. Children born with intersex conditions are still misunderstood and inappropriately treated by doctors around the world in irreversibly harmful ways. call on the U.S. government to ratify the UN Convention on the Rights of the Child, which is the world’s most-ratified human rights treaty and provides important, age-based understandings of the rights of LGBT and intersex youth! President Obama took a very important step earlier this year, publicly calling for a ban on “conversion therapy” for LGBT minors. This unprecedented move by a head of state in support of LGBT youth complements many positive developments by the Obama administration to combat bullying in schools, LGBTQ youth homelessness, and to promote acceptance in families. In honor of this IDAHOT day and its youth focused theme, we call on the President to do all that his administration can do to ratify the United Nations Convention on the Rights of the Child. The United States is one of only two countries in the world that have yet to ratify the Convention, together with the government of Somalia. It’s time for our country to get on the right side of history – we owe it to America’s youth. The Convention on the Rights of the Child states that all children “should grow up in a family environment, in an atmosphere of happiness, love and understanding.” As we think about LGBT and intersex youth on this year’s IDAHOT day, we call on our government to commit to this treaty obligation, but also to commit resources to this important goal, as it did during the donor conference on inclusive development.